Microscope (Gr. , small, and to see), an optical instrument for the examination of minute objects. Microscopes are of two kinds, simple and compound. With the former, the object is viewed directly, either by means of a single lens or a set of lenses employed in the same manner as a single lens. With the latter, an enlarged image of the object is formed by a single lens or a set of lenses, termed the object glass or objective; this image is viewed and further amplified by means of an eye piece or "ocular." Each form is valuable in its place, but as a general instrument of research the compound form, with all the modern improvements, is greatly superior. The invention of the simple microscope is not claimed by any one, but that of the compound has been warmly disputed; it is claimed by the Italians and the Dutch. The compound microscope of the present day, however, is a very different instrument from the disputed invention, and to this last and best form we purpose to devote the most of our attention. - The earliest magnifying lens known, if indeed it was used for this purpose, is the rude one found by Mr. Layard in the palace of Nimrud; it is made of rock crystal, and is far from perfect. Seneca (Qucestiones Naturales, lib. i., cap. vi.) alludes to the magnifying power of a glass globe filled with water; he ascribes the effect to the water, and appears to refer to objects immersed in the water; this was about the middle of the 1st century. "Burning spheres," as they are termed by Aristophanes, were sold in the shops of Athens in his day, about 400 B. C. There is no evidence that lenses were employed at this early date for magnifying, at least otherwise than as reading glasses. It is not until the 17th century that we find powerful magnifiers of glass actually employed for scientific investigation. The names of Malpighi, Lieberkuhn, Hooke, Leeu-wenhoek, Swammerdam, Lyonnet, and Ellis are closely connected with the history of the simple microscope; and their important discoveries attest the value of even this form of the instrument. Most of the magnifiers employed by the early observers were minute single lenses of glass; often small spheres formed by melting threads of glass in the flame of a spirit lamp. The small single lenses of high power are usually plano-convex, the plane side toward the object; when carefully made, having a focal length of from 1/10 to 1/50 of an inch, and well set in shallow blackened cells, with the proper aperture, they perform on ordinary objects tolerably well; much better than the minute glass spheres, as the latter are difficult to obtain free from bubbles. The writer has succeeded better by melting a fragment of plate glass in a small hole in a German silver cup, by means of the blowpipe, and has formed lenses in this way, ready mounted for use, quite equal to those ground and polished by hand. The German silver is blackened by the heat. In order to diminish the spherical aberration in the high magnifier of a single refracting substance, Sir David Brewster suggested the employment of gems; and Mr. Pritch-ard of London, under the patronage of Dr. Goring, ground lenses of garnet, sapphire, and diamond, all of which proved superior to glass lenses of equivalent focus. The diamond lenses upon the whole were inferior to the sapphire; the latter, though not as highly refractive, were free from the veins which rendered several of the diamond lenses useless, though still affected, in common with the diamond, by double refraction. The garnet lenses are free from this latter defect, and when very minute are much superior to glass; the color is not objectionable when the lenses are very small. All the magnifiers composed of single lenses, glass or gems, are surpassed by the doublets and triplets. The invention of the doublet in its best form is due to Dr. Wollaston; it appears, however, to have been a chance discovery. It consists of two planoconvex lenses, having their plane sides toward the object; the posterior lens (that nearest the eye) is three times the focal length of the anterior, and the distance between them is twice the focal length of the shorter. It is evident that the front lens of the doublet must be approached much nearer to the object than if it had been used alone, and the amplification is also less than that of the front lens alone; hence the working distance is much less than that of an equivalent single lens. The great and surpassing advantage of the doublet is the enlarged angle of aperture and diminution of spherical aberration. By "angle of aperture" is meant the angular breadth of the cone of rays proceeding from the object, and refracted through the lens or set of lenses. Evidently, with a single lens, having an aperture equal to its focal length, the angle will be about 55°; in other words, the lines drawn in the same plane from a point to the margin of the lens, this point being in the axis of the lens, and at a distance from its convex surface equal to the diameter of the lens, will be 55°; no single lens, however, will admit anything like this aperture. In the doublet the front lens is approximated much closer to the object than it possibly could be if employed alone, and hence it admits a wider angle; the reduction of magnifying power, at the same time, diminishes spherical aberration, which is still further reduced by the peculiar relations of the curvatures. The doublet thus becomes a very superior instrument, and, when well made and carefully used, surpasses all but the most im-proved forms of the compound instrument. Doublets of gems are far superior to those of glass. Triplets are superior to the doublets; and for a simple microscope the achromatic triplets now furnished by the French and German opticians, as objectives for the compound microscope, will be found very effective. Essentially the English and American achromatic objectives are triplets, but the peculiar mounting of these instruments prevents their use as simple microscopes. So great has been the improvement, that the best modern objectives will transmit angular pencils of 170° to 178°. We may notice here the so-called "Codding-ton lens," or grooved sphere. It is an invention of Sir David Brewster, and when properly made is almost free from spherical aberration, and the chromatic aberration is almost insensible. " It consists of a spherical lens, or sphere with a deep concave groove cut round it. so as to cut off the marginal pencils, and thus give a wider field and more perfect image." The lenses usually sold under this name are simply cylinders of glass having spherical ends, and of course have none of the advantages of larire field and freedom from spherical aberration proposed by Dr. Brewster. When the curvatures of this cylindrical lens are unequal, and such that, the most convex being turned toward the eye, an object placed on the other convex surface is in the proper focus of the lens, it is called a "Stanhope lens;" its use is limited to such objects as can be directly applied to the surface. When of considerable power it may be advantageously employed in searching for diatomaceas; the drop of water supposed to contain them may be examined by applying it to the less convex surface. - All the simple microscopes, and especially the higher powers, require some kind of a stand or carrier. The lower powers and single lenses are usually attached to the end of a jointed rod, which can be moved up and down a stem inserted into a solid base. The most convenient mounting for an inch or half-inch lens, for preliminary examinations or botanical dissections, is that of Messrs. Powell and Lealand of London, and is employed as the mounting of the small condenser for their compound instrument. The movements are complete, and one can place the lens, whatever may be the position of the object, in such a relation to it as will insure the best view. For the higher powers, 1/4 to 1/10 of an inch, a steady well made stand will be required, and some means of adjusting the focus delicately, either by rack work or screw. Various forms have been devised; perhaps, upon the whole, that known as the "Raspail" is most simple, and at the same time of great excellence. It consists of a brass pillar, up and down which a large circular stage is moved by rack work; a large mirror, one side plane, the other concave, swings freely below, and serves to direct the light upon the object; at the top of the brass pillar is placed the lens holder, movable forward by means of a screw, and laterally by swinging round a pin inserted in the top of a pillar; into the opening of the stage is fitted a glass plate, or it may be made to hold dissecting troughs with glass bottoms. It is often convenient, or absolutely necessary, for the examination and dissection of opaque objects, to have the lens inserted in a silver cup or Lieberkuhn, which, receiving the light from the mirror below, reflects it back, condensed, upon the object. These Lieberktihns are usually made of silver. The very simple microscope employed by Ellis in his researches on coralline, in which all the adjustments were effected by sliding by the hand, was fitted with these silver cups. Although the Lieberkuhn is very commonly applied to the low power achromatic objectives, it is now seldom to be obtained with any form of simple instrument, unless by special order; it will be found of the greatest service in minute dissection. As it is difficult to measure exactly the solar focal length of small lenses, a sufficient approximation may be had by the method proposed by Mr. Ross, which answers admirably for doublets and triplets. It consists in " viewing the image of some distant object formed by the lens in question, through another lens of one inch solar focal length, keeping both eyes open, and comparing the image presented through the two lenses with that of the naked eye. The proportion between the two images so seen will be the focal length required. The panes of glass in a window, or courses of bricks in a wall, are convenient objects for this purpose." The comparative focal lengths of two lenses, or sets of lenses, may be determined by holding them at the same distance from the eye and estimating the size of the image formed by each of the same object; thus, if one lens forms the image half the size of the other, lineal measure, its focal length is half that of the other. The same method applies to eye pieces. - For a history of the earlier forms of the compound microscope, the reader may consult the elaborate works of Quekett and Harting and the older works of Adams and Baker. Essentially it consists of two parts, the object glass and the eye piece. The former is now made by a combination, usually, of three sets of achromatic doublets, arranged to give the greatest freedom from spherical and chromatic aberration; the latter, of two planoconvex lenses, with the plane sides to the eye, the lens nearest to the object, or " field lens," being almost exactly double the focal length of the eye lens, and the distance between them a little more than the focal length of the field lens; the ratio is varied somewhat by different makers. In fig. 1, the object placed at P, on the stage T, is illuminated by converging rays, b, b, b, b, reflected from the mirror S. At L is the compound achromatic object glass. C is the field lens, and A the eye lens of the eye piece. With the eye lens one views the image of the object, P', formed by the object glass. The eye piece thus formed is termed a "negative eye piece," or the "Huygenean." The eye piece of Kell-ner is a decided improvement; it is termed "orthoscopic," and the eye lens is achromatic or nearly so; these eye pieces are supplied by the Messrs. Grunow of New York, with their best instruments; the field of view is large, free from distortion, and well defined throughout the whole extent. The orthoscopic eye piece supplied by Mr. Charles A. Spencer of Canastota, N. Y., and more recently as improved by R. B. Tolles of Boston, has both eye and field lens achromatic, and is exceedingly perfect; it is, however, more expensive than the Kellner eye piece. Mr. Tolles has introduced a solid, orthoscopic, negative eye piece, of remarkable clearness and definition throughout, especially fitted for micrometric use, the engraved scale being cemented in the body of the solid eye piece, and perfectly protected from all dust or interference with definition, so noticeable in the use of the eye-piece micrometer in the ordinary way. Mr. Tolles has also introduced what is termed an amplifier, being an achromatic concave of peculiar construction, which is introduced within the body of the microscope by means of an adapter. The corrections of the objective are not in the least disturbed by this arrangement, but the power is doubled. A low eye piece thus gives as much amplification as a higher one, and with the very great advantage of almost perfect flatness of field. The object glasses, or "objectives " as they are now very commonly termed, derive their denominations, 1 inch, 1/2 inch, 1/4 inch, etc, from the fact that the combined sets of lenses give a magnifying power the same as a single lens of the same name. Thus, a 1/4 object glass should give the same amplification as though a single lens of 1/4 inch was used in its place. This term does not refer at all to the working distance, for, as is the case with doublets, the working distance with all powers higher than the 2/3 inch is considerably less than that of the equivalent single lens; it will be apparent that for any given focus the working distance will, in general, be diminished by an increased angle of aperture ; a 1/4 of 90° will have in this respect a very great advantage over a 1/4 of 140°. As regards the merits of the large angle objectives, there are various opinions. Dr. Carpenter is decided in his condemnation, considering that depth of penetration cannot be had at the same time with enlarged 'angle. The skill of the first opticians, Spencer, Tolles, and Wales in America, Ross, Powell and Lealand, and Smith, Beck, and Beck in England, have proved the contrary. Nor is Sir David Brewster's assertion true of large angle objectives, that they give a distorted view. The definition, clearness, and perfect-ness of vision with Powell and Lealand's 1/16 having an angle of 176°, when employed with a low eye piece so as to give the same amplification as a 1/8 with a higher, is greatly superior to that of the 1/8. The chief advantage of the small angle has been considered to be the sort of general view it would give of the whole of a minute object; the working distance being so great that the minute elevations and depressions in the object itself, being but a very small fraction of the whole distance, would not perceptibly affect the focus. In many respects this might be a desirable quality; but the microscopist would quite as often find it a source of error in his interpretation of what he might observe, and he will find it safer to decide as to the elevations and depressions of an object by the removal and approach required to be given to the object glass, in order to bring successively these elevations and depressions into distinct view. In minute and elaborate investigations the high angle objectives are the most trustworthy. Moreover, the skill of the opticians named has enabled them to increase the angle without diminishing so very much the working distance. The 1/12 of Mr. Ross, and we believe the 1/16 of Powell and Lealand, will work through glass 1/100 of an inch thick. - In speaking of the objectives of the prominent makers, we do not desire to indicate any order of precedence; they are all excellent, and all have peculiarities of their own. We must, however, be permitted to notice a little more fully the American artists. The oldest optician, and the one who has been most known in connection with the microscope in the United States, is Mr. Charles A. Spencer of Ca-nastota, X. Y. The object glasses furnished by him, particularly the later ones, are of the highest order; they range from 3 in. to 1/25 in. By many of our most experienced mi-croscopists they are considered superior to the best objectives of the London opticians; they are certainly equal to them. Mr. Spencer, in the earlier days of high angle objectives, no doubt surpassed in this respect all the English opticians; his rare skill and nice manipulation enabled him to perform wonderful feats in this direction, far in advance of anything before accomplished. Mr. Robert B. Tolles, for some time connected with Spencer, but now by himself at Boston, has devoted himself to the perfection of the achromatic objectives with enthusiastic zeal and unparalleled success. His recent objectives are quite equal in defining and penetrating power to the very best of the London opticians, both with central and oblique illumination, and greatly superior to them in the latter case, as regards chromatic aberration; this is true also of Mr. Spencer's objectives. Mr. Tolles's objectives range from 3 in. to 1/75 inch; the latter objective is a marvel of optical art. Messrs. J. and W. Grunow of New York have sent out some very fine objectives, ranging from 2 in. to ^ in. They have not attempted generally so high angles as Spencer and Tolles, but have devoted great attention to the mechanical arrangement and efficiency of their stands, and the accessory apparatus. Mr. William Wales came to this country in 1862, and settled at Fort Lee, N. J. His objectives are known the world over for their excellence; and among rolles, Wales, and Powell and Leland it is now impossible to assign any superiority in the performance of their lenses. The superior workmanship and elegant form of the stands made by Mr. Joseph Zentuiaver of Philadclphia are perhaps not equalled, certainly not surpassed, by the production of any other maker. (See fig. 2.) Anion- other improvements given by this artist to the work-ing microscopist we would specially mention the remarkably thin and steady stage of his "grand American microscope," his invaluable glass stage, and his mechanical finger for picking up and arranging diatoms. The latter invention, described in the "American Journal of Science" for May, 1870, is an improvement on the invention of the distinguished American microscopist Prof. H. L. Smith, described in the same journal for May, 1866. Of English opticians, the name of Andrew Ross has always been placed foremost, being connected with the greatest improvement of the objective, without which the higher powers of large angle would be almost valueless; we allude to the adjustment for cover. First of all the opticians Mr. Ross made his objectives so perfectly corrected for spherical and chromatic aberration, that a new source of difficulty, apparently almost insurmountable, presented itself. He found that these aberrations, so nicely balanced, were disturbed by each varying thickness of the thin covering glass over the object. The expedient he devised to remedy this, was to alter the distance between the first set and the two posterior sets of achro-matics composing the objective, by means of a delicate screw collar. This grand and capital improvement, for which Mr. Ross deserves the rank assigned him, has been adopted by all the American and English opticians, and more recently by the French and German. The English uniformly, if we except the amateur efforts of Mr. Wenham, make the front set movable; the American opticians generally move the two posterior sets, the front being immovable; the latter method is better, the object being kept easier in view during the adjustment, and there being no danger of bringing the front lens in contact with the object. The objectives of Mr. Ross have always maintained a high character, and have been more expensive than those of Powell and Leland, or Smith, Beck, and Beck, though they probably do not surpass them. The business is now conducted by Mr. Thomas Ross and Mr. Wenham. Mr. Ross's objectives range from 3 in. to 1/12 inch. Messrs. Powell and Leland, so far at least as the objectives and accessories are concerned, are quite equal to any living opticians. Both the low and high powers of this firm are of the finest character. While the general plan is the same, there are some peculiarities in their high power objectives worthy of notice. The front set is triple, and the front lens, being of crown glass, is less liable to injury from wiping, or accidental contact with the object, than the soft flint of other opticians; but as it is a very thin planoconvex, merely cemented to the concave, and not burnished in, it is liable to injury by parting the cement. Messrs. Smith, Beck, and Beck (now R. and J. Beck) are more widely known in this country than the other firms. Their "students' " and " educational microscope " are the forms usually sold by the dealers. As opticians, for the lower power objectives, they stand side by side with the others named. They did not until lately furnish objectives higher than 1/8, of 125° angle. We can only mention the names of Nachet, Oberhauser, and Kellner, whose objectives are excellent, but inferior to the American or English; they are, however, much cheaper, and the mechanical work upon their instruments is very excellent. The name of Prof. Amici of Modena was long associated with the microscope. The objectives made by him consisted of six series, with angles varying from 26° to 160°; the higher powers had no adjustment for cover, but the front lens was slightly concave, and a drop of water introduced between the cover and the objective, thus in a measure rendering the adjustment unnecessary. The marked advantage in the plan of Prof. Amici, of introducing a stratum of water between the front lens of the object glass and the thin glass covering the object, was fully shown by its originator 12 or 14 years ago; but it was only after Nachet of Paris adopted the idea and thereby greatly improved the working of his objectives, that opticians viewed Amici's principle with favor. E. F. Hartnack of Paris, the successor of Oberhauser, at once adopted the "immersion' system, as it is called, and soon came to the very front of all objective makers. The advantage of this system is well stated by Har-ting: "As the water is a stronger light-refracting medium than air, the reflection of the rays of light is much diminished at the under surface of the objective; indeed it almost entirely ceases. Hence more rays of light pass into the microscope, and the thin stratum of water has nearly the same effect as an enlargement of the angle of aperture. This favorable modification influences chiefly the peripheral rays, which fall most obliquely. The peripheral rays have most influence on the formation of the image, which takes place in front of the eye piece; and as, by their passing through a transparent object, they are for the most part deflected from their course, and the slight deviations thus caused become visible in the image, the defining power of the microscope must necessarily be increased by the stratum of water." The magnifying power as well as the angle of aperture is increased by the stratum of water in which the objective is immersed, for the water acts like the cover glass, and the lenses must approach each other in proportion to its thickness. The advantage of an immersion lens over the ordinary dry objectives cannot be better shown than by the following experience of Dr. J. J. Woodward, United States army. He had three superior lenses, all made by Powell and Lealand: a 1/25 and a 1/50 dry lenses, and a 1/16 immersion lens. The former lenses could resolve only the 15th band on Nobert's 19-band test plate, but the 1/16 immersion lens not only resolved into lines this 15th band, but also the 16th, 17th, 18th, and 19th bands. Finally, we must not omit to name Mr. Lister, who first pointed out some peculiarities possessed by a combination of three achromatics with their plane sides toward the object, the crown and flint being cemented together, and which were the basis of subsequent improvements. The peculiar form adopted by Lister has long since been abandoned; but the principles are the same. - The stands furnished by the principal makers exhibit a great variety of patterns, and combine various excellences. The most desirable points, viz., freedom from tremor, ease of illumination, particularly oblique illumination, facility in the application of the accessory apparatus, and delicacy of adjustment, are nearly equal in the first-class stands of the principal opticians; but perhaps, on the whole, the best are those of Mr. Zentmayer and of R. and J. Beck. Their large stands mounted on two pillars arc remarkably steady. The stage, thin but substantial, is large, and its movements are very smooth and delicate. The illuminating and accessory apparatus is carried by a sub-stage below, and most easily applied. The illuminating mirror is large, and so mounted as to give very oblique illumination. The rackwork of the quick adjustment is always of the smoothest and best character in all of the instruments made by these firms, and the slow adjustment very delicate. The greatest fault in their stands is the attachment of the slow movement at the lower part of the tube of the microscope itself. In this respect the stands of Ross, Powell and Lealand, Spencer, Tolles, and the Messrs. Grunow are superior. With the high powers, the springing of the tube when the finger is applied, and the shaking when the adjustment for cover is attempted, are disagreeable. The larger students' microscope made by Beck is a very fine instrument; the stage movements and adjustments are very complete. The stands furnished by Ross are heavy and cumbersome; they are, however, exceedingly steady, and finished with extreme care. Those supplied by Powell and Lealand are much lighter, and have some peculiar advantages The accessories supplied by this firm are more complete than those of any other; the stage of their new and largest instrument is very thin, and allows greater obliquity of illumination than that of Beck. Their achromatic condenser is beautifully finished; it has an angle of 170°. The stand itself is not as steady as that of Beck, but the line adjustment is more conveniently placed. The stands furnished by Messrs. Grunow are of different patterns, but all excellent in beauty of finish, smoothness of adjustment, and steadiness, comparing most favorably with the English work. The stands furnished by Spencer and Tolles have many excellences, and are very steady. - All good instruments should have a graduated draw-tube within the main tube, and the latter should be not less than 1.4 inch in diameter. The draw-tube is absolutely necessary for micrometry, and is very convenient to receive the analyzing prism, erector, or Tolles's amplifier. Two adjustments for locus are also necessary, one quick by rack-work and pinion, the other very delicate by screw. The pinion heads should be large, to allow of most delicate movement, and Messrs. Heck and Zentmayer graduate the head of the screw of the fine adjustment, so that the thickness of covering glass may be measured. A skilful observer may dispense with the rack movement, and produce the approximate adjustment by sliding the tube. This is the method adopted in most of the French instruments, and in the "educational" of Beck. The stage movements should be smooth, and but slightly disturb the adjustment when in focus. The adjustment for wear in the English instruments is by spring, in the American by screws; the former involves more work for the maker, but is better. The lever stage, though performing finely when first from the hands of the maker, is much more liable to derangement than that in which the motions are produced by rack and screw. In the Beck instruments the rack and screw are both so low that the latter passes entirely under the bottom of the stage, which is consequently much thinner than it can be made when the screw is introduced between the movable plates the milled heads themselves are thus dropped below the level of the stage, and this is deemed of great importance; this is also the case with Powell and Lealand's large microscope. - One of the most important of recent improvements in the microscope has been the adaptation of the instrument to stereoscopic binocular vision. The binocular microscope, as we now have it, is the result of gradual progress in the application of Prof. Wheat-stone's discovery of the stereoscope, from the year 1851, when Prof. Riddell of New Orleans first attempted • the production of micro-stereoscopic relief, to the recent simple and universally used invention of Mr. Wenham. M. Nachet, Prof. II. L. Smith, Messrs. Powell and Lealand, Mr. Tolles, and Dr. Barnard have also devised special plans to obtain the same effects. Some of them have their own special advantages, but Mr. Wenham's recent invention is so simple that it has been almost universally adopted by American and English makers. We will therefore only describe here his invention, and refer the reader who desires information of the plans of the above named gentleman to Beale's " How to Work with the Microscope" (London, 1868); to Carpenter "On the Microscope" (London, 1868); and to the report of Dr. F. A. P. Barnard " On Machinery and Processes of the Industrial Arts, and Apparatus of Precision," exhibited at the Paris exposition of 1867. The pencil of rays which has passed through the objective ln is cut in half by the interposition of a trapezoidal prism a, as shown in fig. 3, A; half of the rays of the pencil pass up the tube as usual, and the other half enter the anterior face of the prism and are reflected from the lateral surfaces I and c, and emerge at d to proceed up the secondary tube 2, as shown in fig. 3, B. To obtain stereoscopic effect it is absolutely necessary, on account of the crossing of the rays of the pencils in the objective, that those rays which have emanated from the right-hand half of the cut pencil should enter the left eye, and vice versa. If this does not take place, we shall have, instead of stereoscopic relief, a pseudoscopic effect; that is, elevations will appear as depressions and depressions as elevations. This was the case with Prof. Pviddell's invention and with the first plan adopted by Mr. Wenham. In Mr. Wenham's recent invention, which we have just described, this is avoided by causing the rays reflected from the face c of the prism to cross those going directly up the tube, so that the right eye receives the left half of the pencil, and the left eye the right half. The distance between the oculars 1 and 2, fig. 3, A, is adapted to different eyes by means of racks and a pinion, by which they are moved inward or outward. There are two great advantages in using the binocular microscope: first, the eyes are subjected to equal work, and thereby are not so liable to fatigue and injury; secondly, with low powers we obtain an insight into the three dimensions of a body, for in the stereoscopic binocular we see into the depth of a body as well as view its length and breadth. This is very important in the study of tissues, as we see how they are arranged in order of distance from the surface of the body. - The usual accessories accompanying the microscope are: an achromatic condenser, a bull's-eye condenser, small condenser, stage and eye-piece micrometers, polarizing apparatus, camera lu-cida, animalcule cage, stage forceps, glass parabola, erector, Lieberkulms and dark wells, frog plate, etc. The name of achromatic condenser has been given to an illuminating apparatus consisting of an achromatic objective of large angle, furnished with a wheel of diaphragms and central stops; when the latter are used, oblique illumination is obtained. This condenser is exceedingly useful in the ordinary studies by the microscope. With the proper adjustment it affords a fine achromatic illumination, revealing the structure of the object with great beauty and clearness; but in unskilful hands it will be of little service. So far as oblique illumination is concerned, we prefer unilateral light, though some particulars of structure are best revealed by aid of the achromatic condenser. The condenser is placed below the main stage, and can be adjusted by independent rackwork, so as to give the best illumination. The condenser of 170° angle, introduced by Powell and Lealand, is spoken of very highly by the English micro-scopists; the delicate markings of navicula rhoniboides, when viewed with their 1/16 objective, are said to be as well defined as those of pleurosigma hippocampus viewed with a 1/4. The achromatic condenser of Beck has an angle of about 100°. When used with the central stops, the proper point for adjustment may be determined by removing the eye piece, after the objective has been brought into focus, looking down the tube, and moving the condenser by means of its own rack and pinion, until the black stop appears sharply defined in the centre of the field, and a bright illuminated ring around it. If the stop is removed, the whole field will appear brightly illuminated, unless the objective be of much greater angle than the condenser. A condenser of greater angle than 100° cannot be used unless the object be placed upon very thin glass; all difficult test objects should be mounted in this manner on a slip of mahogany, or on a perforated glass slide. The condenser itself, or the carrier, should have some means of adjustment to make its axis coincide with that of the objective; the front set of lenses is generally made to be removed, thus affording an illuminator of lower angle, to use with thicker glass and objectives of low power. In using the achromatic condenser by lamp light, the bull's-eye condenser is employed to render the rays parallel, and the plane side of the mirror is used. The bull's-eye condenser consists of a thick plano-convex lens, of short focus, mounted upon a stand so that it can be used for the illumination of opaque objects. Very excellent oblique illumination may be obtained by condensing the flame of a candle or lamp, placed about two feet from the stage, upon the under surface of the slide, the light being placed in front, and the stage slightly turned up to receive it; or, the microscope being placed horizontal, the light may be off at one side, according to the obliquity desired. As the thickness of the stage will not ordinarily allow illumination at a much greater distance than 60° from the axis, a sub-stage, attached to the upper plate of the main stage, but carrying the slide entirely below it, is furnished by Messrs. Gru-now and by Powell and Lealand, and may be readily attached to any microscope; this allows illumination of any obliquity. In using the bull's-eye condenser for this purpose with a lamp, the plane side must be presented toward the object; and if the flame be flat, its edge must be presented. The small condenser is used in the same way as the bull's-eye. Where very intense illumination is desired, the bull's-eye is placed near the source of illumination, with the plane side toward it, so as to render the rays nearly parallel, and then this beam of light is further condensed by the small condenser. An achromatic lenticular prism of short focus is very valuable for illumination. The prism should be so mounted that it can be placed to reflect converging rays on the object at any angle, and in any position, both below and above the stage. Experience in its use will to a great extent supply the need of an achromatic condenser. - The stage micrometer is a slip of glass ruled into .01" and .001" of an inch; it is used in conjunction with the camera lucida, or to determine the value of the divisions of the eye-piece micrometer. The French scale is the millimetre divided into 100 or 200 parts. The eye-piece micrometer, known as Jackson's micrometer, is a finely ruled glass scale, introduced by means of an opening between the field and eve lens of the eye piece, so as to be in the focus of the eye lens. The value of the scale is determined by placing the stage micrometer on the stage, and viewing the divisions with the given objective and eye piece; thus, if 10 divisions of the eye micrometer corresponded with one (.01") of the stage micrometer, then the value of one division of the eye-piece micrometer would be -001" with that particular object glass and eye piece. The stage micrometer being replaced by any object, its dimensions may be readily ascertained by noticing how many divisions of the scale are subtended by it. The micrometers of this description are very convenient, and, when carefully used, accurate. The definition is slightly injured, however; this objection is obviated by Mr. Tolles's solid micrometer eye piece. If the observer has only a stage micrometer, the divisions may be projected on paper by means of the camera lucida; then, with the same objective and eye piece, the image of any object being projected on the paper, its dimensions are at once ascertained. Messrs. Powell and Lealand furnish a cobweb micrometer susceptible of great accuracy; it is similar to that used for astronomical purposes. Messrs. Grunow have somewhat improved upon Powell and Lealand, and their cobweb micrometer with orthoscopic eye piece is very delicate. They also furnish Fraunhofer's stage micrometer, which has the advantage of giving the absolute dimensions of the object, without reference to the power of the objective or eye piece. With careful use the eye-piece micrometer is as accurate as any of these, and much less expensive. 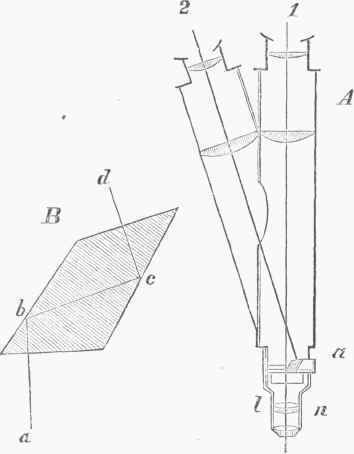 - The polarizing apparatus consists Of two Nicols prisms of calc spar with revolving fittings, one (called the polarizer) designed to be placed below the object, the other (termed the analyzer) above, either directly over the eye piece, where it generally cuts off part of the field, or at the lower end of the draw-tube; here, if the prism be good and not too long, it will not much affect the definition, and will allow the whole field to be visible. Very much depends upon these prisms. Those supplied by the Messrs. Grunow are very large and line, and the analyzer is placed by them directly above the objective; it is too large, however, to be placed so low down without injury to the definition, Beck's analyzer is much'shorter than Grumow's, and may be used either over the eye piece or placed in the end of the draw-tube.There is much difference in these prisms; some scarcely injure the definition at all, and others are very poor. The polarizer is usually somewhat larger than the analyzer. The calc spar is very soft, and, if not protected by thin glass covers, liable to injury. A set of revolving selenites, to go below the object, between it and the polarizer, accompanies the prisms. There is not much choice in the method of mounting and revolving these prisms; perhaps Grunow's is the most elaborate, but, when the revolving selenites are included, we think Beck's arrangement the most complete. A " selenite stage " is often employed, simply placed under the object, on the stage of the microscope. Mr. Darker has contrived a stage of this kind, in which the selenites revolve. A complete polarizing apparatus is very important, and should be attached to every good instrument. Sometimes tourmalines are used instead of the prisms of calc spar; they are objectionable on account of their color, but placed over the eye piece do not at all obstruct the field of view. - The camera lucida furnishes the means of drawing or sketching outlines of objects viewed in the microscope, some provision for which is absolutely necessary. Often this is merely a plate of neutral tint glass, which, placed in front of the eye piece, at an angle of 45°, when the microscope is turned horizontal, reflects the image to the eye, and at the same time pencil and paper upon the table may be viewed through the glass. A better contrivance than this is the steel disk of Sommering, made slightly smaller than the pupil of the eye; this, when placed in front of the eye piece, enables one to view object and paper at the same time. In these contrivances, and also in the Nachet drawing prism, the object, being viewed after but one reflection, is reversed right and left. Where it is necessary to finish a drawing by the eye, this is a serious difficulty; it is therefore preferable in all cases to use the Wollaston prism, which is applied so as to give an unobstructed view of the whole field, and with which the drawing is precisely as it appears in the microscope without the prism. A little practice is required to use it well, but if the observer will take care to have the paper strongly illuminated, while the object is only enough illuminated to be seen distinctly, no great difficulty will be found. But whoever does much original work with the microscope should not depend on drawings made with the camera lucida, but should learn to photograph the objects he has discovered, or the histological preparations he has made. The eminently successful work of Drs. Edward Curtis and J. J. Woodward, at the army medical museum in Washington, should encourage all who have the means to adopt this accurate method of permanently securing the results of their labors. - The animalcule cage is a simple contrivance by means of which a drop of water may be retained between two glass plates, which may be approximated so as to just confine the object, without allowing, if it be living, too much freedom of movement; it is often made to serve the purpose of a compressor, for crushing soft bodies more or less during the examination. - The stage forceps is exceedingly useful for the examination of small insects. At one end is usually placed a bit of cork, enclosed in a brass cylinder pierced with holes, to receive an insect pin, in case it be desirable to examine cabinet specimens. The forceps should have free movement in all directions. The recent ones supplied by Beck have a ball and socket movement; they are attached to the upper stage plate, and thus are moved by the rack and screw of the stage. - The parabola was originally contrived by Mr. Wen-ham, and was composed of a silver reflector; it is now made of glass, the outer surface having the form of a parabola. The rays of light, entering the glass through a plane surface below, suffer total reflection, and emerge without refraction, the upper surface of the truncated parabola being concave, so that each reflected ray strikes upon the surface perpendicularly. The glass parabola has a small hole in the axis, carrying a sliding rod, with a small disk, which may be elevated or depressed according to the angle of aperture of the objective, until the direct light is excluded; the object is then exhibited entirely by oblique light on a dark field. The polycystina are beautifully shown by this illumination, and also parts of insects with the lower powers. - The erector consists of two plano-convex lenses, to be inserted into the lower end of the draw-tube; by means of these the object is seen without being inverted. The magnifying power is much diminished, and the definition injured; and one who intends to dissect under the compound microscope, had better at once learn to manipulate without it. The ingenious erecting prism of Nachet may be used, which does not in the least injure the definition. In this case the upright stand of Nachet will be found very steady and convenient. - The upright position of the continental stand, with its short tube and low stage, is better adapted for real work, in dissection and in mounting objects, than the more elaborate English and American instruments; while the latter are superior for the resolution of test objects and for the study of tissues already prepared and mounted under the low vertical instrument. - Lieberkiihns are polished silver specula fitted to the lower powers, the polished surface being presented to the object; they are used in conjunction with what are termed dark wells, which consist of a slender rod carrying at the summit a blackened cap of brass, and are placed directly under the object so as to cut off the direct light; where the object itself is mounted on an opaque background, they are unnecessary. The light reflected from the mirror below, falling upon the Lieberkiihn, is condensed upon the object. There are many opaque objects winch cannot be well seen without this kind of illumination, and it is justly considered a very important addition to the apparatus. - The frog plate is a flat mahogany or metal plate, having a slightly elevated glass platform, and the edge of the plate pierced with holes or furnished with split pins. By means of threads tied to the toes of the frog, the web may be spread out on the plate, the body of the frog being enclosed in a bag and strapped to the plate; care must be taken not to draw the string too tightly around the mouth of the bag where the leg protrudes, as it stops the circulation. The bag may be dispensed with by holding the frog a moment or two in water of 120° F., when it becomes perfectly rigid and apparently insensible. In this condition it may be opened, and the circulation of the blood in the veins and arteries of the mesentery most beautifully exhibited; care must be taken to keep the parts moist. For minute dissection we have found the eye instruments exceedingly useful. Fine scissors and forceps are made for this purpose, of most excellent quality, by Char-riere of Paris. - In working with the monocular microscope, one should acquire the habit of keeping both eyes open. If the eyes are allowed to rest easy, and then the focus carefully adjusted to suit while thus resting, no great fatigue will be experienced in using the microscope; if, however, the focus is only approximated, and then distinct vision obtained by forcing the eye, severe pain and headache will ensue. The writer has worked with a bright light for six or eight hours, with but slight intermission, without fatigue. Long experience and great caution are requisite in interpreting the phenomena revealed by the microscope, and one soon learns that things are not always what they seem. This, however, cannot be justly urged against its use. "When directed by skilful hands, and guided by experience, its revelations are of the most exalted and truthful character. No one can hope to succeed in the department of natural history who is not a skilful microscopist. A north light, coming from the left hand, the stage movements being at the right hand, is the best light for day. At night, the naphtha or coal oil lamp, as now made by Beck, gives the most intense and steady flame. The gas jet is difficult to manage for delicate work. - A simple and very effective arrangement for illumination is that used by Dr. Edward Curtis of New York: "A small petroleum lamp is placed in a cigar box, which stands on one of its ends. On one side of the box is cut a small aperture, in which is placed a piece of blue glass, to soften the light as it passes to the microscope mirror. Another larger opening is made in the front of the box, and is occupied by three different glasses. The one nearest the lamp is a square piece of ground glass; the next one is also square and flat, but colored blue. Finally, a plano-convex lens of long focus is placed at such an inclination as to condense the rays of light, thus softened, on to the work-table for use in dissecting or in arranging preparations." - Many of the "test objects " have been so long known that it seems almost unnecessary to mention them. The markings on the silicious shells of diatoms have been highly recommended. As general tests, they are no doubt very serviceable, but they are not entirely to be relied upon unless the same specimen is used in comparisons, on the same stand, and with the same illumination. Strife in 1-1000 of an inch. said to be 75 "
J. D.Moller of Wedel, in Holstein, who is well known for his beautiful mountings, furnishes a plate on which are mounted, in a line, the following 20 diatoms, in the order designated by Dr. Grunow: 1, triceratiumfavus; 2, pinnularia nobif is; 3, navicula lyra, var; 4, navicula lyra; 5, pinnularia interrupta, var. ; 0, stauroneis phanicenteron; 7, grammatophora marina (more coarsely marked than Bour-goyne's variety); 8, pleurosigma Balticum; .'. pleurosigma acuminatum; 10, Nitzschia amphioiys; 11, pleurosigma angulatum; 12, grammatophora oceanica subtilissima (marina); 13, surirella gemma; 14, Nitzschia sigmoidea; 15, pleurosigma fasciola, var. ; 16, surirella gemma (longitudinal lines and heads); 17, cymatopleura elliptica; 18, navicula crassiner-vis, frustulia Saxonica; 19, Nitzschia curvu-la; 20, amphipleura pellucida. Dr. Woodward has photographed surirella gemma, and has obtained the longitudinal strife as "rows of minute hemispherical bosses. The fine transverse strire counted longitudinally at the rate of 72 to the 1/1000 of an inch. Transversely these lines were resolved into beaded appearances, which counted laterally 84 to the 1/1000 of an inch.1' ("American Journal of Science," May, 1871.) But all organic markings are variable as to dimensions and visibility, and hence are not comparable except when one and the same object is used in the comparison of the efficiency of two lenses. Mr. Nobert has succeeded in giving comparable test objects to microscopists by ruling on glass plates bands of parallel lines, the distances between the lines of successive bands constantly decreasing. His most recent plate contains 19 bands. The distance between the lines in the first band is 1/1500 of a Paris line, and increases by 1/500 in each to the 19th, in which it is 1/10000. The lines in the higher orders of bands are as close together as those of the diatoms whose markings are difficult to resolve. M. Schultze resolved the 15th band, and subsequently Dr. H. Frey resolved the 17th, with a Hartnack immersion No. 11. In 1869 Dr. "Woodward resolved the 18th and 19th bands with an immersion 1 1/16 of Powell and Lealand, and Dr. Edward Curtis photographed them. Dr. Woodward says ("American Journal of Science," September, 1869): "The photograph of Dr. Curtis was taken without an eye piece and with such a distance that the immersion 1/16 gave 1,000 diameters. The illumination was by sun-light passed through the ammonio-sulphate of copper, a 1/5 objective of 148° angle of aperture being used as the condenser, without diaphragm or stop, and obliquity of light obtained by means of the centring screws of the secondary stage. . . . Returning now to this immersion 1/16, it may be remarked that the work just done with it has an important bearing on the question of the real limits of microscopic vision. Robert, in sending me the plate above described, wrote me that in his opinion the 15th band was the limit of possible microscopic vision. He based his opinion upon Fraunhofer's formula with regard to the spectra of gratings, and upon the known wave length of light undulations. Dr. Barnard of Columbia college, New York, after reading Nobert's letter, writes me that in his opinion Fraunhofer's formula does not apply to the visibility of fine lines when observed with a modern microscope of high power, since the great angle of aperture of the objective permits oblique rays to reach the eye, and Fraunhofer's formula applies only when the eye is perpendicular to the grating. Dr. Barnard is therefore of the opinion that the limit suggested by Nobert has no real existence. In his letter, which I should mention was written before he was aware that I had satisfactorily resolved any of the bands beyond the 15th, he proposed that a trial should be made, to resolve the test plate with monochromatic light, of colors longer than the violet which I had been using. Accordingly, obtaining monochromatic light by a prism on which a ray of sunlight was thrown, I succeeded after some trials in satisfactorily resolving the 19th band with each of the colors of the spectrum, from the violet to the red. It may therefore be concluded that the present limit to microscopic vision is simply the goodness of the objective; and the rapidity of recent improvements may well lead us to hope for a still further advance." Subsequently Nobert ruled, for the scrutiny of Drs. Barnard and Woodward, lines approximated even closer than the 19th band, but the test has exceeded as yet the resolving power of their lenses. In judging of the merits of an objective, it appears to us that oblique illumination has been too much dwelt upon. The angle of aperture having been ascertained, the general merits will be much more apparent by use of tests, Nobert's lines for example, with the best central illumination. If the scale of podura plumbea is employed, select a medium-sized rather than a large one. The wedge-shaped dots should be sharply defined, without fog or mist. The scales of the American podura are not dotted but lined, and are not so suitable. - See Quekett "On the Use of the Microscope" (London, 1848; last ed.,1865); Robin, Du microscope (Paris, 1849); Harting, Bet Mikroskoop (Utrecht, 1852; translated into German by Dr. Theile, Brunswick,1859); Wythes, " The Microscopist" (Philadelphia, 1853); Schacht, "The Microscope," edited by Cnrrey (London, 1855); Griffith and Henfrey, "Micrographic Dictionary: Introduction" (London, 1850); Gosse, "Evenings at the Microscope" (London and New York, 1859); West, " Half Hours at the Microscope" (London, 1859); Beale, "Application of the Microscope to Clinical Medicine" (2d ed., London, 1859); Clarke, "Objects for the Microscope" (London, 1859); Hogg, "The Microscope" (London, 1867); Beale, "How to work with the Microscope " (London, 1868); Carpenter, "On the Microscope, its Revelations, and its Uses" (London and Philadelphia, 1868); Woodward, "Photo-micrography," in the "American Journal of Science," vols. xlix. and 1.; F. A. P. Barnard, "Microscopes," in his " Report on the Apparatus of the Exact Sciences exhibited in the Paris Exposition, 1867;" H. Frey, "The Microscope and Microscopical Technology," translated from the German and edited by George Cutter, M. D. (New York, 1872); "Transactions of the Microscopical Society of London;" and " Quarterly Journal of Microscopical Science" (London).